Birding tends to be an extremely freeform activity, demanding only we pursue our bliss to the best of our means and ability. But, every so often, the call is sounded, and the sharpest eyes and ears on the planet are pressed into service. This, the weekend of the Great Backyard Bird Count, is one of those times: tell us how you contributed to citizen science. I hoped to add the Carolina Wren that’s been hanging around my house to the tally, but settled instead for Northern Cardinal, the most common GBBC species at the midway point. 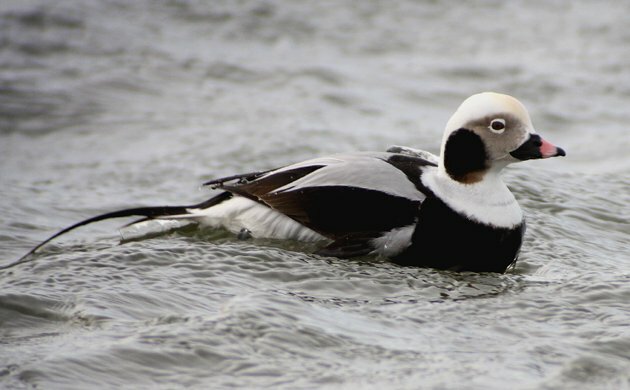 Corey’s Best Bird of the Weekend was any of the Long-tailed Ducks he spotted this weekend along the coast in a fruitless search for his first Harlequin Ducks of the year. The long-tails were a nice consolation prize. The harbours and quiet waterways around Lake Ontario are mostly frozen over but where people go walking and can feed the ducks and swans there’s lots to see. Scores of Trumpeter Swans, hundreds of Mallards and American Black Ducks, and lurking around the edges are White-winged Scoters, Greater and Lesser Scaup, Rednecks, and Common Goldeneye. Corey dipped?!? On a bird? IMPOSSIBLE!!!! Anyway, my best bird of the weekend was another Rough-legged Buzzard, or Hawk, or Roughleg, or whatever you English-speakers currently call it, near Mannhein / Germany. We are retired so we do our birding any day of the week. Our best bird in the last week was a new one for me: a ruby-crowned kinglet, observed at Hueco Tanks State Park & Historic Site, just outside El Paso, TX. Those birds apparently winter here. Fun bird to watch. @Corey: What a great find! Absolutely beautiful. My tentative BBotW was a Spotted Towhee that popped out of the brambles, singing and calling away, as I wrapped up a run yesterday on a side street here in Issaquah, WA. I have a feeling today might bring something even more interesting, though … if so, I’ll report back later! Two days of guiding in the Carara area was as birdy as always with around 170 species identified but the best was a Common Potoo- the first that has been seen in the park as far as any of the local guides can recall. For once, the bird I hoped to see this weekend was exactly the bird I saw: the double-crested cormorant. Not only did I see it, but I found a perch where there ALWAYS seem to be cormorants. The only downside is that the perch is on the other side of the water, out of photographic range. I may have to (gasp!) cross the water. A female New Zealand Scaup with three adorable fluffy just hatched but already diving chicks. My wife and I are traveling by RV this winter and birding many of the National Wildlife Refuges and other wonderful birding areas as we travel. Every day is a weekend for me and the best bird recently was a beautiful male Vermillion Flycatcher. I photographed him in a city park in Tucson, Azizona.